I have no idea what's happening to me. If that wasn't bad enough, now her ruby slippers magically appear on my feet, and slowly, I'm becoming her. Now I need to get to Emerald City and see the Wizard if I want to stop the transformation and return home. But the yellow brick road is no cake-walk, and I don't know what I'll find at the end of this journey. Luckily, I have three brothers I meet along the way to help me on my journey. Each of them is vying for my affection, as if it doesn't matter that my skin is turning green. 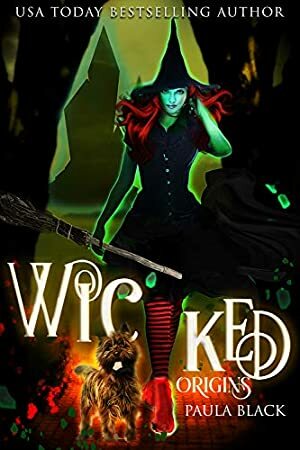 Wicked Origins is a modern YA Fantasy Retelling of L. Frank Baum's original Oz tales. Log In to track Paula Black on eReaderIQ. to be notified each time the price drops on any book by Paula Black. to stop tracking Paula Black. We started tracking this book on October 12, 2018. The price of this book has changed 3 times in the past 192 days. The lowest price to date was $0.99 last reached on February 16, 2019. The highest price to date was $3.99 last reached on February 21, 2019.